CMOMM™ is an investigative forum that researches the death of Madeleine McCann, which many of us believe occurred much earlier in the week, possibly the Sunday or Monday. Most of the news from the UK is 'fake news' as the search continues to 'pin the tale on the patsy'. Litigious Gerry McCann: "I would like to emphasise that I strongly believe in Freedom of Speech...I don't have a problem with somebody purporting a theory..."
A section for our 'SMITHMAN' and other McCann-related Polls. A very warm welcome to our new members. Please introduce yourselves here, tell us how you found the forum and what interests you about this case. Members and guests who explore this forum will find that there is serious doubt about all claims that Madeleine McCann was alive after Sunday 29 April. This e-book has been written by a retired Police Superintendent detective, using the official Portuguese Police files. The most logical way to address the question of when Madeleine died is to go back in time to determine what was the last piece of credible evidence which proves she was alive. A selection of documentaries for reference and discussion on the Madeleine McCann case. After forensic analysis of the 'Last Photo' there is little doubt now that the pool photo CANNOT POSSIBLY have been taken on Thurs 3rd. The McCanns say Maddie was sitting by the pool. She wasn't. Gerry McCann: 3rd June, 2007: We want a big event to raise awareness that she is still missing. It wouldn't be a one-year anniversary, it will be sooner than that." MMRG (Madeleine McCann Research Group) is a group in pursuit of the truth about what really happened to Madeleine McCann. A section for blogs written by professionals: Paulo Reis, Hobs, Colin Sutton, Joana Morais, Spudgun and many more! Paulo Reis has nearly 40 years experience working as an investigative journalist. He reports not just from his homeland but around the world, covering important and high profile news. "The British police might investigate the McCann's residence for the possibility that the body of Madeleine McCann might have been transported into England." Dr Vernon Coleman: "The mystery continues to fascinate the world. Watching the McCann industry at work is like watching a slow motion train wreck." Facts that the British media don't tell us about what really happened to Madeleine McCann. HiDeHo spends many hours producing thousands of videos and researching the discrepancies in the official Portuguese police files. "Why would anyone take a photograph of their daughter's pyjamas before she is abducted? They didn't know she was missing until 10pm that night. Or did they?" The dogs alerts allow a short and tragic story to be told. Behind the sofa; on Kate's trousers; cuddlecat; to a shelf in the parents' bedroom; then in the boot of the car. The sequence is not difficult to follow! Research about the Creche Records, Telephone Records, and the Guests who were at the Ocean Club when Madeleine McCann 'disappeared'. The Tapas 9 sworn official police statements of May 4, May 10 2007, and April 2008, are filled with inconsistencies that often contradict their public media statements. Detailed research by forum members, many of whom are professionals such as detectives, lawyers, fraud investigators and accountants, who have read and analyzed the Portuguese police files. Statement Analysis analyzes the words people use to detect concealed & missing information, and whether the information that person has provided is true or false. The sentence of the Supreme Justice Court: "And let it NOT be said, also, that the appellants were cleared by the archival dispatch of the crime-process." The official police files released to the public in Aug 2008 comprised 11,223 pages. The main case file is supported by a file of sightings & other appendices including conducted interviews. Is a real resolution in the pipeline? Would the Portuguese police reopen the case without significant, compelling evidence? Would they really 'shelve' it for a second time? Despite the findings of the Portuguese Police, Operation Grange was given a remit by the Home Office to investigate Madeleine's disappearance "as though the abduction occurred in the UK". Dan Hodges, Daily Telegraph: "Two e-fits have been produced. According to police they are of the same man. But in fact, they are of two men. But we're all part of the circus now. So we say nothing." Lord Bell, Bell Pottinger: 'The McCann's paid me £500k to keep them on the front page of every newspaper for a year'. They then attended the Leveson Inquiry to complain about press intrusion! The McCann's PR spokesman, Clarence Mitchell, former head of Tony Blair’s Media Monitoring Unit, once boasted that his job was ‘to control what comes out in the media’. Kate McCann, Ambassador 'Missing People'. Is this the same mum who hired criminals then got Operation Grange set up costing millions of pounds, and yet didn't find Madeleine? There have been dozens of bogus sightings of Madeleine, planted in the British tabloids by Clarence Mitchell, that have exploited and frightened many innocent children. According to journalist Tracey Kandohla, some of the donations have been siphoned off from the Fund and can be used for buying a house or building equipment. McCann Case - a calculated hoax? "The claimed Alpha Investigations Group, purporting to be the McCann's detective agency 'headed by ex cops Edgar and Cowley' was, like a few other things in this case, a deliberate hoax." If the McCann's are innocent of the disappearance of their trademarked daughter why do they tell lies to the Police; Government; media; and even under oath at Leveson? Connecting the dots...why does former Deputy Chief Constable, Jim Gamble, keep linking his interest in the subject of child sexual abuse to the McCanns? Alpha Investigations Group, the McCann's detective agency, didn't exist; two of their ex PI's were jailed for fraud and one of their financial backers interfered with witnesses. The “Dossier of Death” led directly to the suicide of Brenda Leyland after she was doorstepped by Martin Brunt on 2 October 2014. Journalist Sonia Poulton promised a damning new documentary for screening in 2015 to tell the "Untold Story of Madeleine McCann". Ambassador for Missing People Kate McCann stopped supporting Ben's online campaign after Kerry Needham questioned the £10m spent so far by Operation Grange. 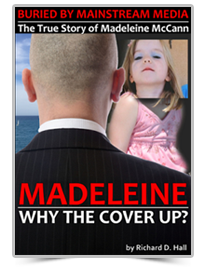 Read the book the McCann's tried, and failed, to BAN in the UK. All 22 chapters, translated into English by AnnaEsse, can be read in this section. Discrepancies between Kate McCann's "account of the truth" and the official Portuguese Police files of interviews & statements which were released into the public domain in 2008. Former arguido Sergey Malinka's new book promises 'new facts' in the decade-long mystery. "Due to legal issues it cannot be me to tell you what the truth of this case is; but you can find it here among the lines of this book." "Summers and Swan have written the first independent account drawing on in-depth interviews and rigorous analysis of both the Portuguese & British police investigations." The FOI Act gives you the right to access recorded information held by public sector organisations. CMOMM has sent many FOI requests regarding Madeleine McCann. CMOMM has posted various petitions on the Government website calling for a full public and judicial Inquiry at which the McCanns and their friends would be questioned. Tony Bennett's 'Right to Reply' to entrapment, over the banned book '60 Reasons', by journalist Mike "I lied, My Lord" Gunnill. Tony Bennett: "What evidence do you have that Madeleine was abducted?" Isabel Martorell, Carter-Ruck: "I don't have the evidence. I rely on what the McCanns told me." Material removed from public view on demand from Prime Suspects, not deemed innocent by the Portuguese Supreme Court, Kate & Gerry McCann. Read what the McCanns don't want you to see. Pamalam was the first to start saving Gerry's bizarre blogs. Many people thought he was sending out coded messages. Her excellent website is another great resource of information. A selection of McCann-related videos and press and blog articles saved for posterity. If you find something interesting you can post it here. Claim by Steve Marsden: "CEOP shows Maddie is missing on 30th April 2007"
In every one of these cases the person responsible for the crime has reported the victim as 'missing' or 'abducted'; or has made a public appeal for help or information; or given false statements to Police. Rico Sorda: "If you want to discredit an investigation you must first discredit the persons leading it. This will be done by trashing the evidence. Some English journalists excel in this." CMOMM member Tony Bennett has helped the fathers of STUART LUBBOCK and LEE BALKWELL get justice and compensation for their murdered sons.